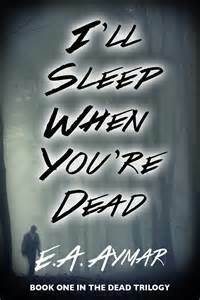 The quirky mystery thriller, “I’ll Sleep When You’re Dead”, reminded me so much of “Three Graves Full” where another unassuming protagonist bumbled his way into danger. There is something about a story where the plot seems to happen innocently that makes reading it infectious. For the last three years, Tom Starks mourned his wife who died after a brutal and random attack. Starks was determined to kill her murderer, who was recently released from prison, until he realized he could hire someone to perform the killing for him. Unfortunately, the clan he hired to kill his wife’s murderer soon targeted Tom! There was a humorous element to the story that made it fantastic! The easy writing made this was a very quick read for me. I loved every aspect of the story: Tom’s relationship with his daughter and his boss, Tom’s dark and secret rendezvous with a mystery woman, and his interactions with the members of his family. All these relationships made Tom likable because he seemed to be an average guy. The author’s inclusion of a discussion of “The Count Of Monte Cristo” that Tom led in his community college class was an easy way for the author to raise metaphors and symbolism present in the main story. Things did sort of happen quickly and without much buildup, but that was part of the book’s charm. I am really excited to read the next two books! This entry was posted in Fiction, Mystery, Thriller. Bookmark the permalink. ← Hello February! Will A “Morning Glory” Always Signify Love In Vain? Enter your email address to subscribe to fastpageturner and receive notifications of new posts by email.